Today I found some spare time and made this bag, which I know I will use a lot! Fabrics used are from Heather Bailey's Freshcut Collection which I just love. 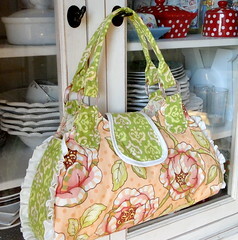 The pattern used is Melly & Me's ''Frill Me''. I modified the pattern a little as I always do. I think I will make a few more of these!